Christian theology is awesomely sabotaged by the New Testament. Its portrayal of god, so deeply rooted in ancient superstition, cannot possibly hold up under close scrutiny. And, sometimes, Christians do feel the pain of getting suckered in. This level of divine attention enables the whole prayer thing, which means that God knows what every person is thinking; we are assured by the preachers that we all will be held accountable for evil thoughts. And when the devout refer to God-given talents, well, how would that happen? Apparently God arranges stuff at the genetic level. This god is really involved. But then something comes along that is so horrific, so inexplicably evil, that Christians stagger in disbelief and shock. “How could God have allowed that to happen?” The god-is-always-good theology promoted by the pastors and priests doesn’t work when brutal reality smacks us. It was five years go yesterday that a gunman massacred twenty kids—5 and 6 year olds—and six of their teachers in Newtown, CT. The shooter used bullets that explode when they hit their targets, so those children were torn apart. Nothing at all in life had prepared the first responders for the carnage they found at the school; it’s unlikely that photos of that crime scene will ever be released. In the face of such pain, I really don’t want to hear preachers manufacturing lame excuses. Nothing can exonerate God: don’t even try. It was especially hard that year to get into any “Christmas spirit,” but even so, ten days later I attended a Christmas Eve party at the home of a Catholic friend. It was during the grace that she made reference to the shooting—I was so unprepared for what I was about to hear. She uttered a prayer that, supposedly, would be heard by her Lord. Did he appreciate being blamed? She said: “God must have wanted more angels.” I was stunned. I left the room. Had she really no idea what she was saying? The all-powerful, loving God who runs the Cosmos resorts to shooting kids to get more angels? But her blind piety mandated that God be exonerated, no matter the cost. She had given permission for that bloodthirsty God of the Exodus, who killed all the first-born in Egypt, to wreak havoc in suburban Connecticut. Is this really the God she wants? 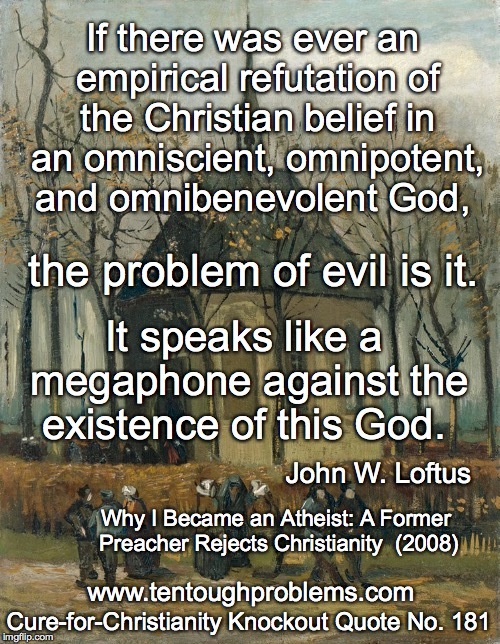 My friend had proposed an evil god whom Christian theologians would abhor. 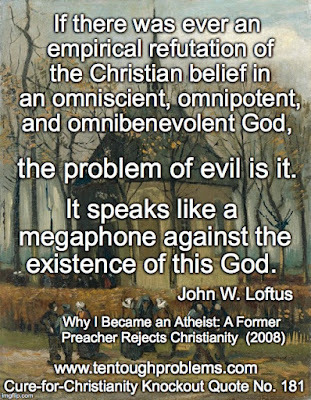 Well, most of them; some theologians have argued that what we perceive as evil—from our limited perspective—is still part of God’s ‘good plan.’ But I suspect that most theologians go through the same agony as laypeople do—and they recoil in horror as I did when piety-amateurs say terrible things. They have enough trouble explaining how their god allows such evil; they don’t want to deal with a god who engineers it. The person in Scotland who left the Teddy Bear took a different route: God is negligent, incompetent, careless. "A year ago this week, Satan drove up Fifth Street in a Ryder truck," said Jannie Coverdale, whose two grandsons, Aaron, 5, and Elijah, 2, were among the 19 children killed in the blast. "He blew my babies up. He may have looked like a normal man, but he was Satan. And I have to wonder, 'Where was God at 9:02 A.M. on April 19? '” It’s the most natural question for those who have been told that God has his eye on us. Why didn’t he do something? • The guy who drove to the Newtown School? How about a flat tire on the way to the school, ending up in the ditch, or a fender-bender. When the police arrive, his cache of weapons is discovered in the trunk. Off to jail—not to the school. • Or plant better ideas in his head. How many billions of times have Christians prayed, “Oh Lord, give us the wisdom to…. [you fill in the blank]. That must mean that God has some powers of mind manipulation—how else did he “inspire” a thousand pages of Bible? You can’t have this concept of God and be okay with him not being clever enough to stop a killer. See what I mean when I said at the outset that the New Testament God cannot hold up to close scrutiny? The theology is sabotaged by God’s spectacular neglect of the world. The catalogue of evil and human suffering—we all know this—is endless; another evil: Christians get used to shrugging it off. "God wanted more angels" is shrugging it off. So, God wants more angels, or oversleeps, or is missing in action? No, it’s much simpler than that, and so very obvious: The Cosmos functions without a god—certainly without a micromanaging god who cares about sparrows and humans. There is no evidence—none whatever—to support such belief. Why can’t believers just snap out of it?